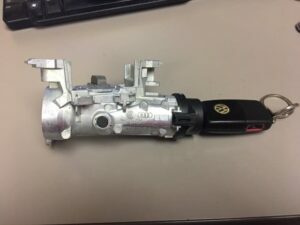 Have you ever come across the situation with your Volkswagen Jetta, where you need to turn the key very hard to start the car. Or if the key does not turn to the off position and you cannot remove the key from the ignition cylinder. In a lot of cases, the stiffness of the ignition causes lots of turning force required and this breaks the key from the remote shell. These symptoms are all signs of the ignition housing/steering/switch lock mechanism getting damaged internally. We at auto key pro, have the expertise to come on site and rectify the situation same day or next day worst case, subject to part availability from dealer. We can either rebuild the current housing or replace it with a new one, both have warranties tied to it so that the user has a piece of mind. This type of problem can occur to other VW models and Audi as well. If your VW Key does not turn past the accessories position, or if it does not turn at all, or if the key is stuck in the ignition cylinder, we have the solution for you and you do not need to spend on diagnostics fee through Dealer or Tow it to a mechanic shop. We can on the spot replace the part and also refurbish the switch blade key if it’s lose from the shell, as there is a higher chance for the key blade to break and get you stranded and we do not want that to happen. Among that service, we service ignition cylinders for all Makes and Models vehicles. Rekeying, rebuilding, replacing services are all available. Our prices are fixed and no “hidden fees”. We guarantee customer satisfaction as we want to make sure the job is done right. Auto Key Pro Locksmiths specializes in car keys and ignition cylinders and key fob programming and steering lock mechanisms, and refurbishing broken shells and repairing key fobs. We also offer lost keys on site services for 90% of vehicles so customers do not worry about stock availability or waiting time. We have a mobile locksmith van service for Hamilton, Ancaster, Stoney Creek, Burlington, Waterdown, Binbrook, Grimsby, Caledonia, and the Greater Hamilton Area.